More than 3,000 violent patients in England were barred from seeing their GP in 2018, figures obtained by the BBC have revealed. The individuals were subject to the Special Allocation Scheme, a register for violent or abusive patients. A GP practice in West Yorkshire said employees had been given self-defence training, in response to rising levels of violence and abuse. 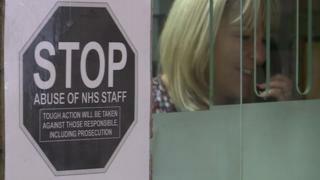 NHS England said staff should be able to carry out their work without fear. More than 300 million GP appointments took place in England last year and staff said they were being subjected to growing levels of physical and verbal abuse from patients. A practice nurse in Leeds said she had been left fearing for her safety and that of colleagues, after being confronted by hostile patients. “I know one nurse who’s been assaulted in the surgery, and I’ve been left scared dealing with verbally abusive patients,” said Lucy, whose name has been changed to protect her identity. Practice managers and receptionists said they often experienced the majority of patient abuse and aggression. Will Menzies runs the Keighley Road Surgery in Halifax, West Yorkshire. “Two years ago, a patient rang the surgery wanting some medicine and he became increasingly aggressive,” he said. Employees at the practice have become so concerned about rising levels of abuse and threats of violence they have recently been given self-defence training. “Our staff asked us to provide this sort of training, so they have a range of strategies and techniques to deal with this growing issue,” said Mr Menzies. A Freedom of Information request made by BBC News to NHS England revealed 3,024 people were subject to the Special Allocation Scheme in 2018. Localised figures for 2017 showed the clinical commissioning group area with the most was Birmingham and Solihull. Patients subject to the scheme receive medical treatment at designated GP practices, where additional security measures are in place. A study by the British Medical Journal found the number of recorded crimes at GP practices rose by a tenth between 2015-16 and 2016-17. Dr Richard Vautrey, chair of the British Medical Association’s General Practitioners Committee, said many incidents of patients being violent did not get reported but he cautioned against the idea medical staff were being increasingly targeted. An NHS England spokeswoman said the organisation had “revised its Special Allocation Scheme last year to help ensure practices maintain a safe environment for their patients and staff”.